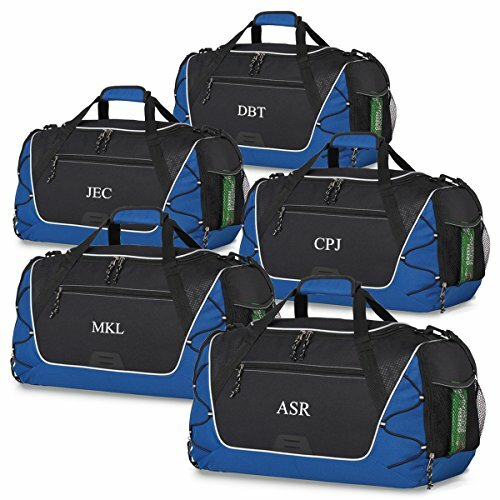 Set of 5 Men's Personalized Sports Duffel Bag is a practical gift that guys can really use. It is Crafted with durable water-resistant fabric, brass hardware, heavy-duty zippers and leather detailing, this piece is made to last. They all say something about you, so why are you carrying around that old sports duffel bag? Make a statement with our personalized black sports duffel bag. Why bring just any old ratty duffel bag to the gym when you can proudly display your own personalized flair? Our sports duffel bag can come with your name, your favorite team, or even a small slogan intertwined with the canvas. Please include personalization in Gift Message Box at checkout. Front zippered pocket. Bungee cords for extra storage. Large U-shaped opening to zippered main compartment. Tone-on-tone digital print accents provide added appeal. Shoe tunnel with breathable, ventilating mesh. Removable floor board for extra support. Side mesh pocket and side zippered pocket. Padded grab handles.Removable, adjustable shoulder strap.